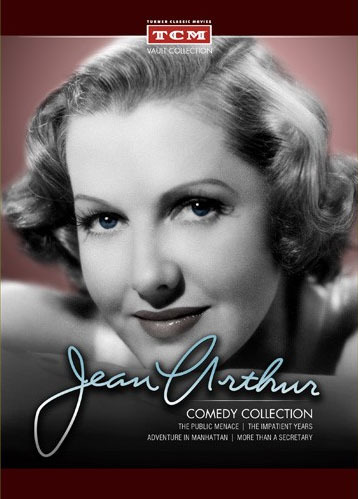 Thanks to Kristina's roundup at Speakeasy, I learned the good news that Turner Classic Movies is releasing a new entry in the TCM Vault Collection on October 17th, the Jean Arthur Comedy Collection. 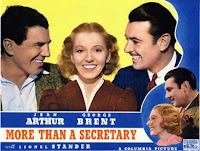 The set contains four films; I've previously seen three of them, and my reviews are linked here: THE PUBLIC MENACE (1935) with George Murphy, ADVENTURE IN MANHATTAN (1936) with Joel McCrea, MORE THAN A SECRETARY (1936) with George Brent, and THE IMPATIENT YEARS (1944) with Lee Bowman. All four titles are digitally restored and remastered. There's no information yet about whether or not extras are included. I enjoyed all of the films I've seen to date, classing them in the "enjoyable but not great" category. This set should be of definite interest to Arthur's many fans. The main drawback is the relatively steep $34.99 price for four films, although given the generally higher cost of most made-to-order DVDs these days, the price doesn't look so bad. It's interesting to note that while past TCM Archive releases have been Universal films, the Arthur titles are from Columbia. I've seen these films but I'd love to have them in a proper box set!